I must confess I have been looking forward to this day for a rather long time. 9 months, 3 weeks and 3 days (give or take a week or two). Patrick is now firmly established in 6-month sized clothing, which means my favorite onesie has been put back into action. 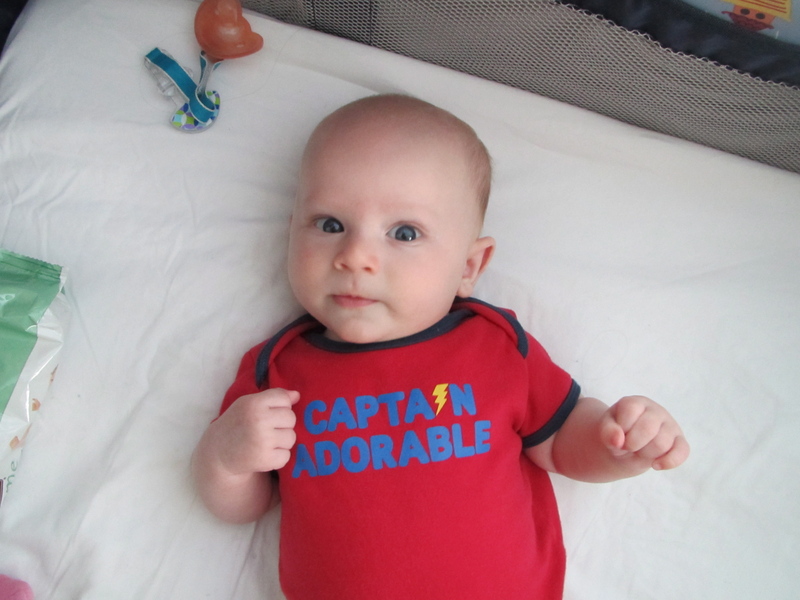 Captain Adorable has made a come back. Capt. A #2 is getting an earlier start. Baby O wore the same outfit from around 5 to 7 months. Baby P fits it at 2 1/2 months. He probably would’ve fit it earlier, but I am in denial about how quickly he’s blasting through the bins of baby clothing. I think he’s trying to hit 12-month sizes by Christmas so he’ll fit his winter layers (and adorable pea coat). As one of my all-time-favorite onsies, this one will be included in my eventual attempt at a baby quilt. 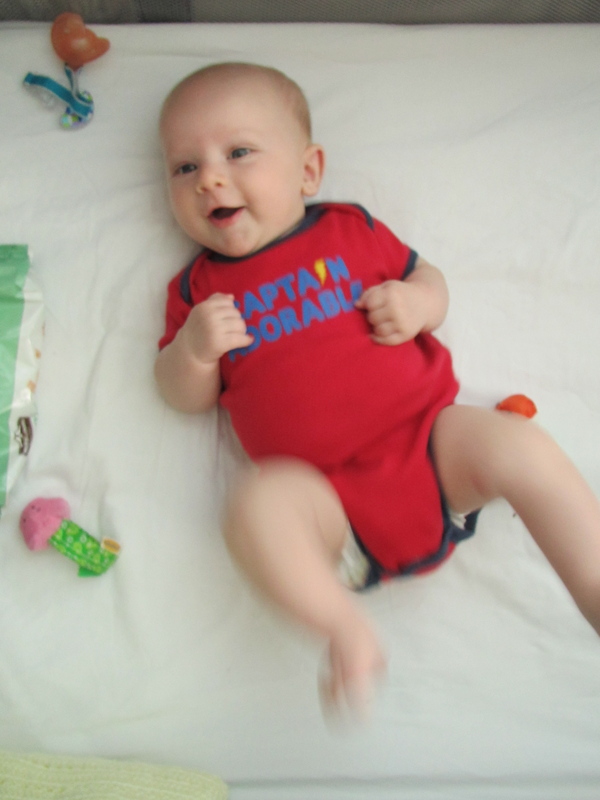 It is the onesie O wore when he waved the Spoon of Power and admonished the Rattlesnake. 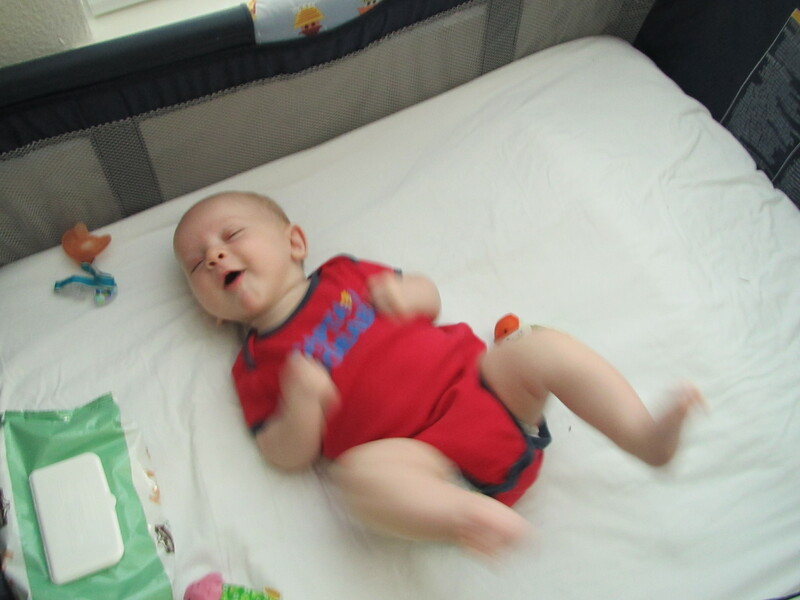 Baby P’s newest features include a social smile, even more advanced head control, kicking his legs and making oh-so-cute baby noises. 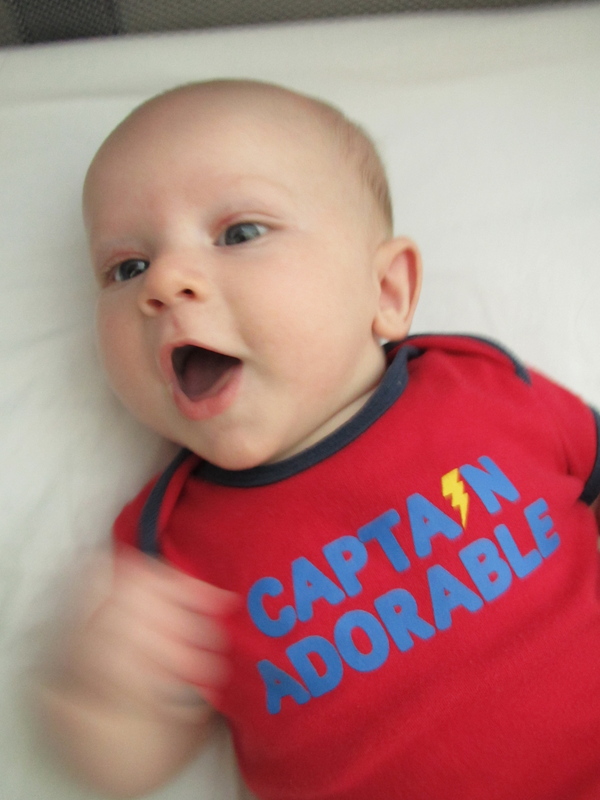 Like Big Brother O, Baby P is truly worthy of the Captain Adorable onesie. And yes, if Baby P had been a girl, I’d make her wear this onesie as well. Women can be captains too. Like P, Leena seems to be growing faster than her sister. I can’t believe how quickly the months are passing the second time around. Sure, there are agonizing afternoons when I wonder how in my right mind I allowed myself to have two children so close in age, but then I just look at their cuteness. I agree, you have two Captains Adorables.